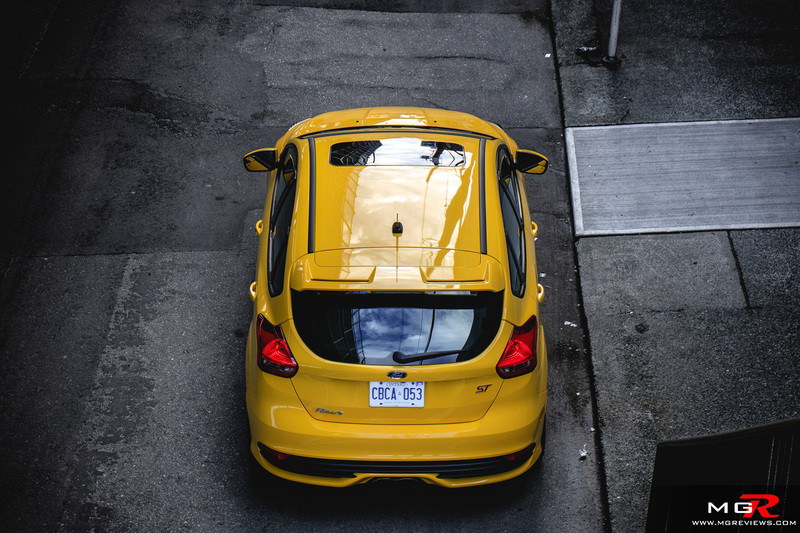 The Volkswagen GTI started the hot hatch revolution back in the 80’s and while hot hatchbacks are not as popular in North America as they are in Europe, that hasn’t stopped Ford from trying to take some of the market away from VW. The Focus ST is their hot hatch to take on the GTI and on the face of it, they seem to have a strong contender. Engine – The hot hatch recipe is to take a small engine and give it a lot of power. 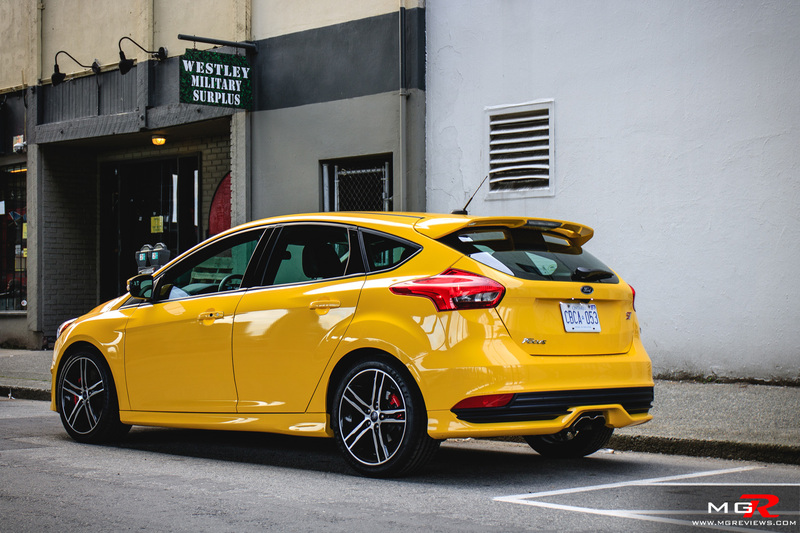 The Ford Focus ST is no different with a small 2.0L turbocharged engine that produces 252hp and 270 lb-ft of torque. Perhaps more impressive than this little engine’s torque figure, is how responsive it is. Normally turbocharged engines take a few seconds to respond to driver inputs at low rpms. This one however almost instantly responds to a heavy foot even at rpms as low as 1000. It’s also quite economical with a real world combined city & highway fuel economy figure of 10.2L/100km as I managed to achieve in my week of test driving it. However one drawback is that the fuel tank is less than 50L which makes fuel stops a common occurrence in a given month. 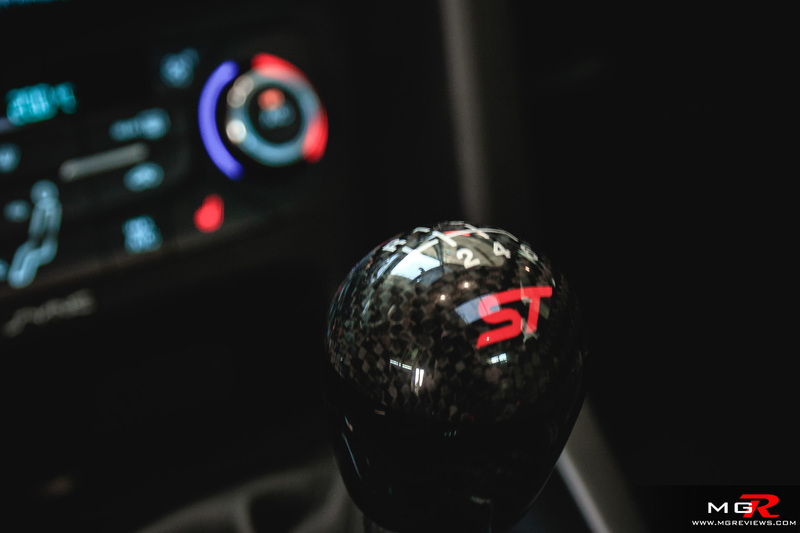 Transmission – Thankfully on a hot hatch like this the only transmission option is a 6-speed manual. The clutch is relatively light for the amount of power it needs to control and the shifter is smooth in operation but the throws from gear to gear are a bit on the long side. The gearing of this particular transmission is on the short side which hampers the 0-100km/h time because 100km/h can only be achieved in 3rd gear whereas most other cars can reach it in 2nd. 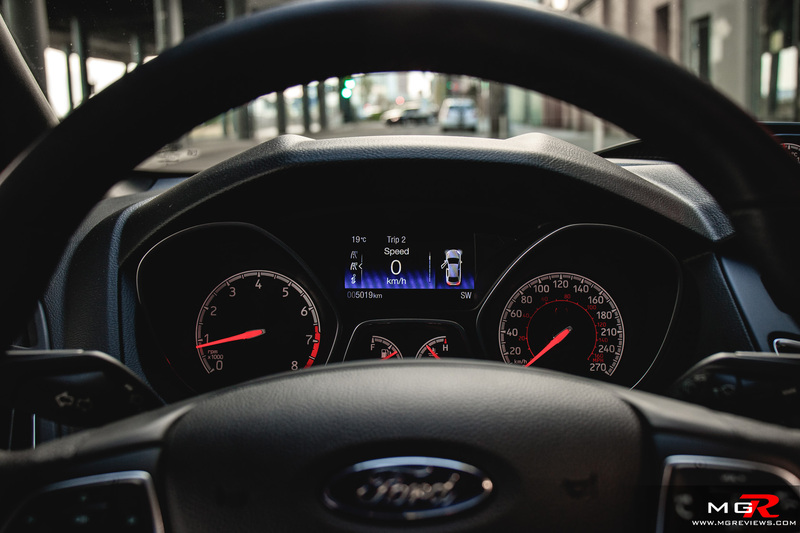 Braking – The brakes are excellent on the Focus ST. They’re not the Brembo fixed calipers of the Focus RS but they do a very good job of bringing the ST to a stop. For those with a heavy foot the brakes may be a bit “grabby” and performing a heel & toe downshift is difficult due to the cramped pedal box and the throttle pedal that is significantly lower than the brake pedal. 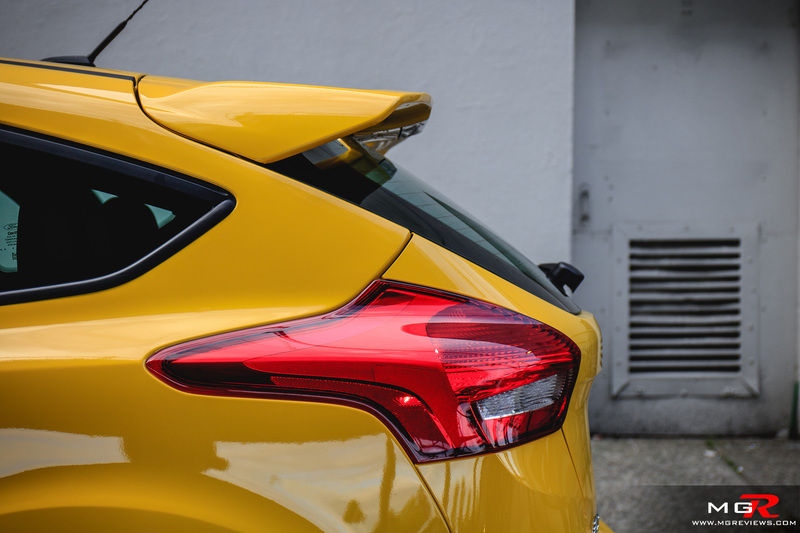 Handling – Arguably the most important aspect of a hot hatch is how it goes around a corner and the Ford Focus ST does a great job of doing that. The steering is precise and communicative and the Goodyear Eagle F1 tires provide a decent amount of grip for an all-season tire. On the limits of adhesion, understeer prevails as one would expect from a front wheel drive car but lift off the throttle and the back will try to step out of line and induce oversteer. 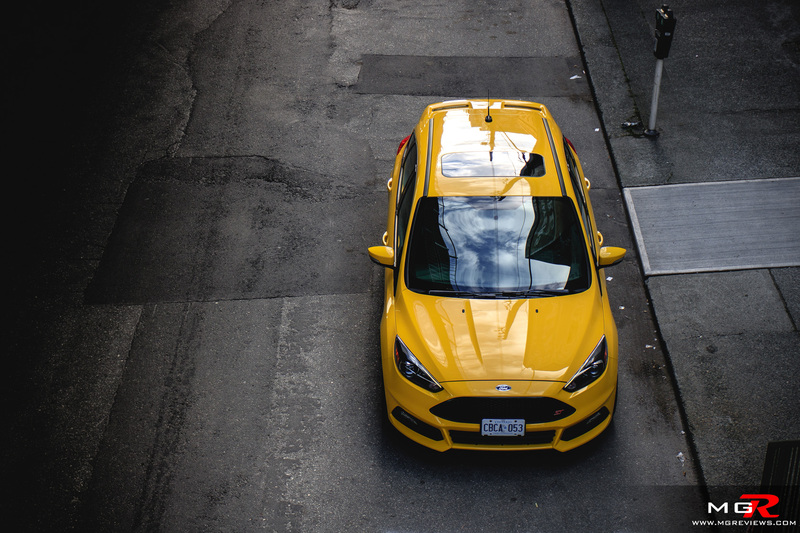 The lift-off oversteer characteristic of Ford hatchbacks is what makes this ST almost as much fun as an all-wheel-drive competitor but the biggest problem with the way it handles is the catastrophic torque steer. 270 lb-ft of torque being delivered to the front wheels only is a lot of power for the front wheels to deal with. In 1st or 2nd gears under full throttle, you are constantly fighting the steering wheel to try to keep the car going in a straight line. Wheel spin is also very present when accelerating quickly in the first 2 gears while exiting a corner. 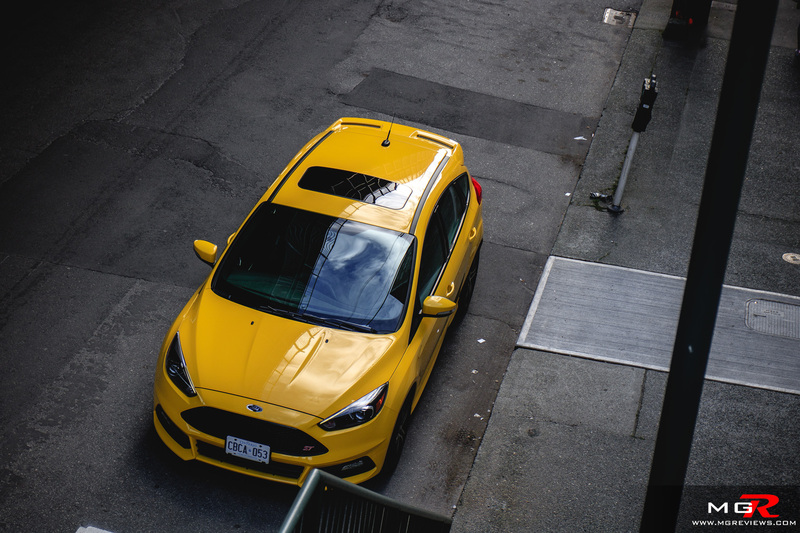 The Focus ST does not have a limited slip differential and instead relies on the brakes to help control wheel spin and to try to send power to the opposite wheel. The system definitely helps the car as opposed to not not having anything at all but the car would be faster still if it had a proper limited slip differential. 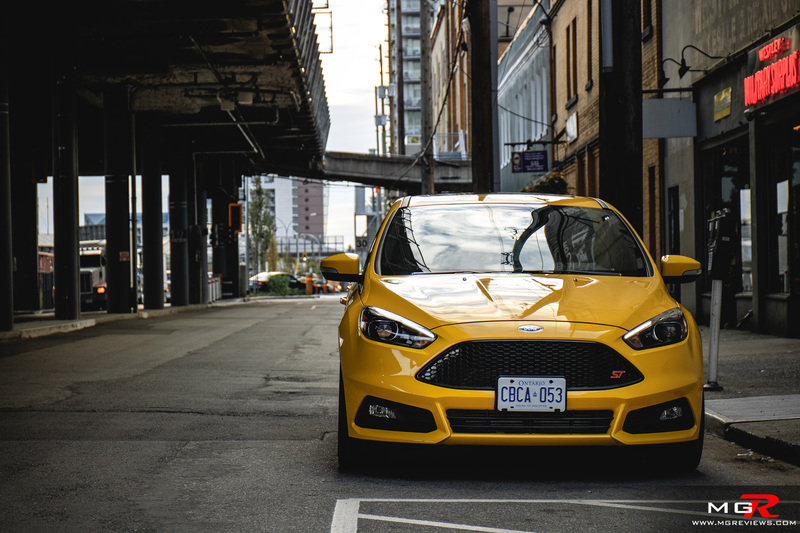 Ride Comfort – Understandably, the Ford Focus ST has stiffer suspension than a standard Focus. It’s not a back breaking ride but it would be best to try and avoid heavily potholed streets in a city. The Recaro seats do an excellent job of keeping you in them but if you’re a …. bigger person, they are far too narrow. The seats are also quite hard which makes long distance trips a bit more tiring than they would normally be if the seats provided softer padding. In the back, there’s enough room for adults but the seats offer absolutely no side bolstering so if the driver wants to drive quickly around corners, you’ll be sliding from side to side in those back seats. 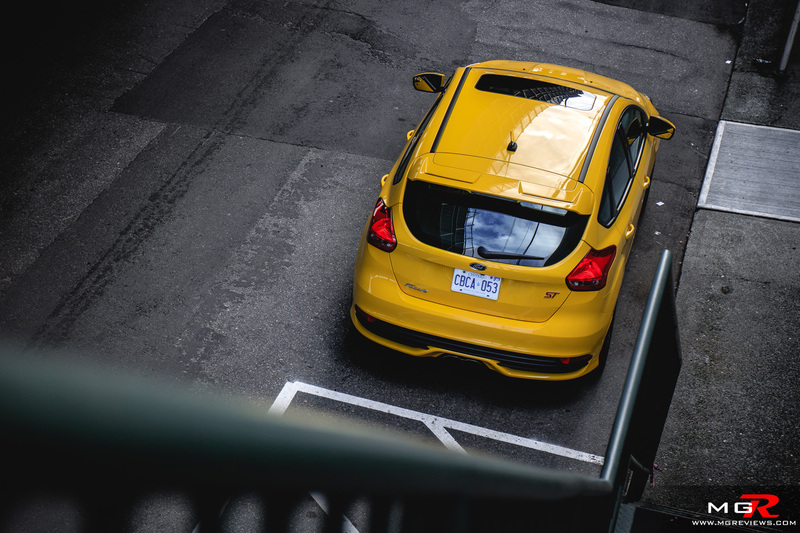 Noise, Vibration, & Harshness – The Focus ST feels like a stable and well built vehicle. There are no odd noises and squeaks coming from the interior trim and for the most part, exterior noises are kept outside. Highway speeds do allow for some wind noise but it’s not unbearable. One thing this hot hatch could do with more of is engine and exhaust noise. It’s too quiet for a sporty hatch. 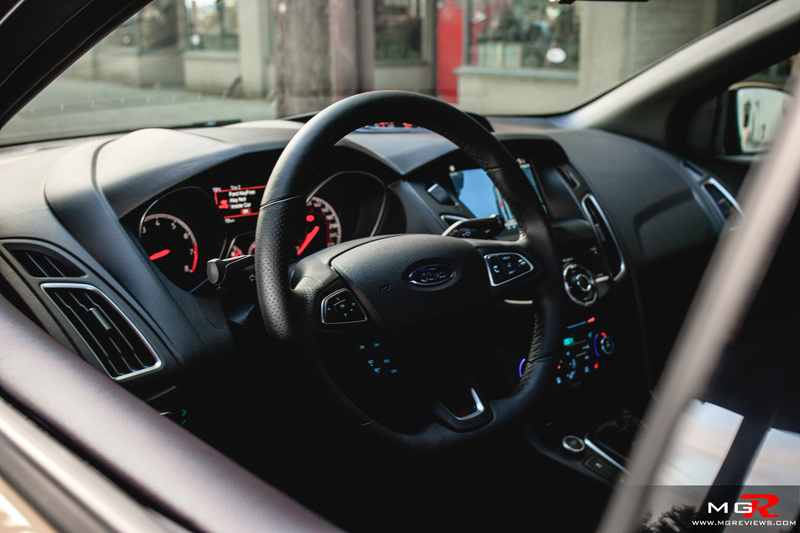 Interior Design – The first thing that you notice when climbing into the cabin is the large flat-bottom steering wheel. After that, it’s the 8” touchscreen in the center of the dash. The touchscreen is a bit sunk into the dash to reduce glare on a sunny day but this makes it a bit of a reach to operate it. 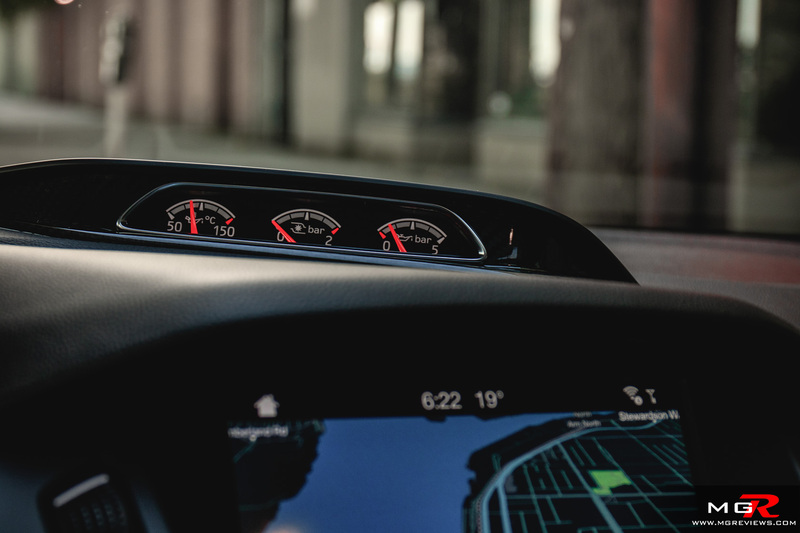 Compared to a normal Focus hatch, the ST is sprinkled with sporty touches including the carbon fiber wrapped hand brake and gear shifter along with the 3 analog gauges on top of the dash. 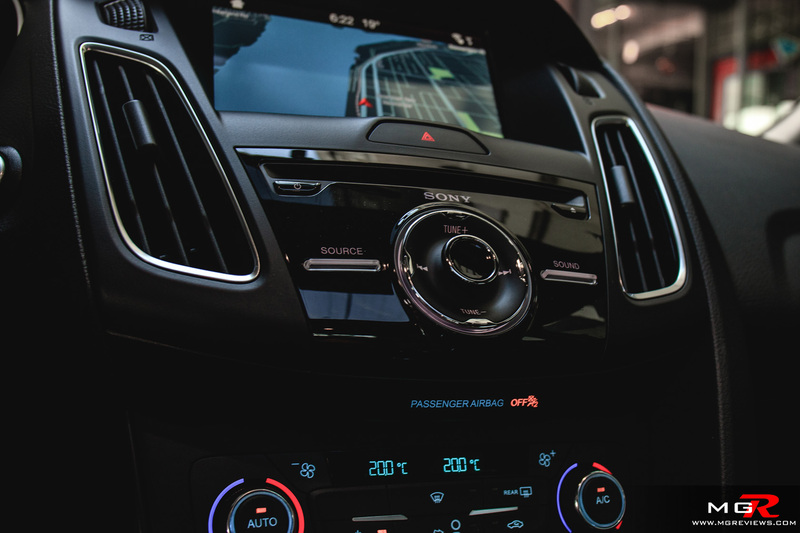 Gadgets – Unfortunately certain features such as blind spot monitor and lane departure warning are not available on the ST but it is still well equipped with heated seats and steering wheel, navigation, Apple CarPlay and Android Auto, sunroof, climate control, and a good sound system. The new Ford Sync 3 infotainment system is responsive and better laid out than the previous iteration. Not to mention it is also much better to look at. 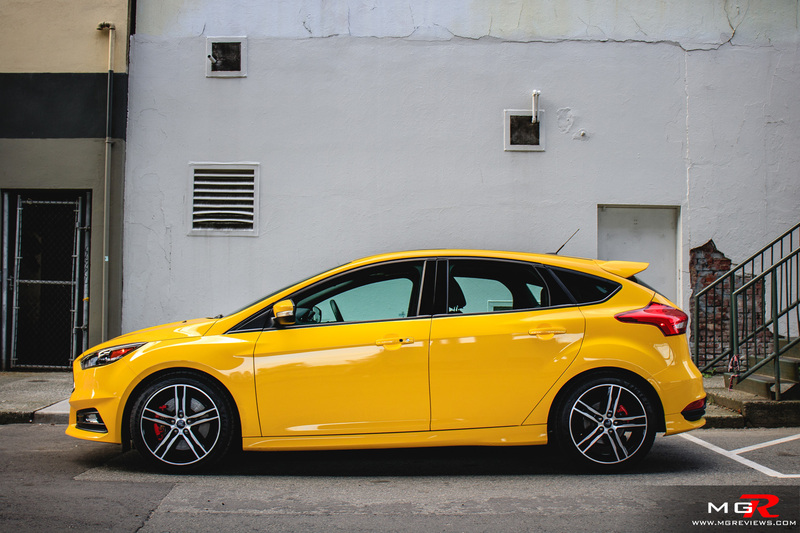 Exterior Design – Since its introduction back in 2013, the Focus ST has seen a few nip & tuck changes to its body. 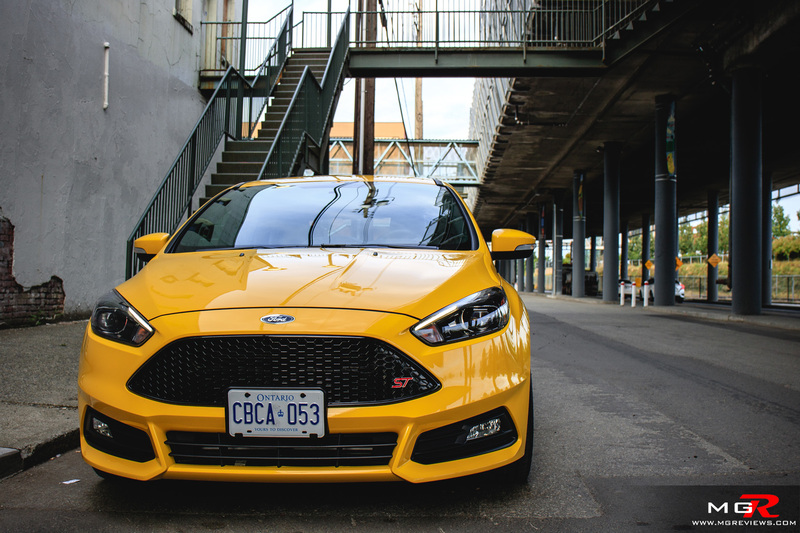 The angular grille is in-line with the rest of the Ford model lineup and the lower bumper has more prominent angles than the regular Focus although not as aggressive as the Focus RS. Around back it looks almost the same as a normal Focus apart from the big spoiler and the central exhaust. Overall a pleasant shape and the yellow paint does grab attention from passerbys. Overall the 2017 Ford Focus ST is a lot of fun to drive for a relatively low price. 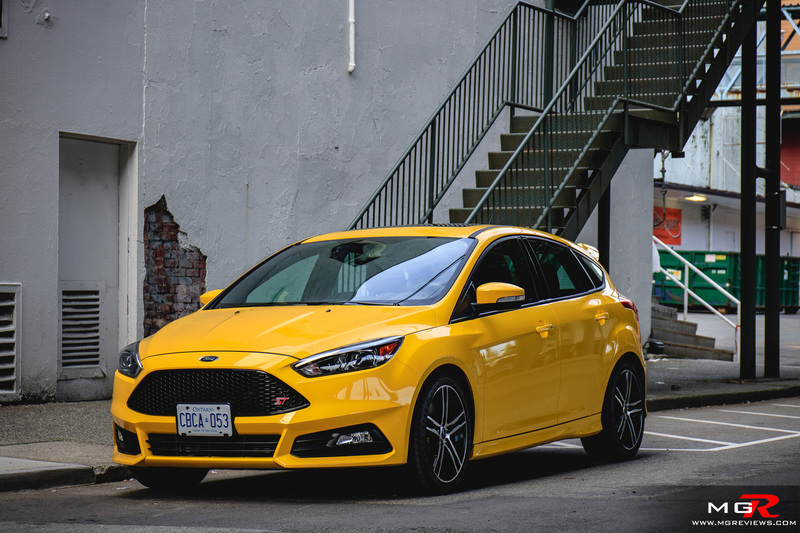 With incentives this particular Focus ST with the black wheels and navigation options, costs a little over $33,000 whereas a comparable Volkswagen GTI (with only 220hp might I add) costs in the vicinity of $38,000. So it depends on what your needs are. For a fun to drive experience, the Focus is the better bet but for day to day driving, the GTI may be a better choice.